iCAT® Cone Beam technology provides a 3D digital tomographic view of the patient’s area of interest. A traditional x-ray is only two-dimensional. With Cone Beam systems, our surgeons are able to get a full 360 degree view of the tooth and all surrounding areas. The 3D Cone Beam scanner provides nearly limitless views of the teeth while using less radiation than traditional medical CT technology. This new technology is fast, simple and painless, providing many wonderful benefits that were unavailable only a few years ago. 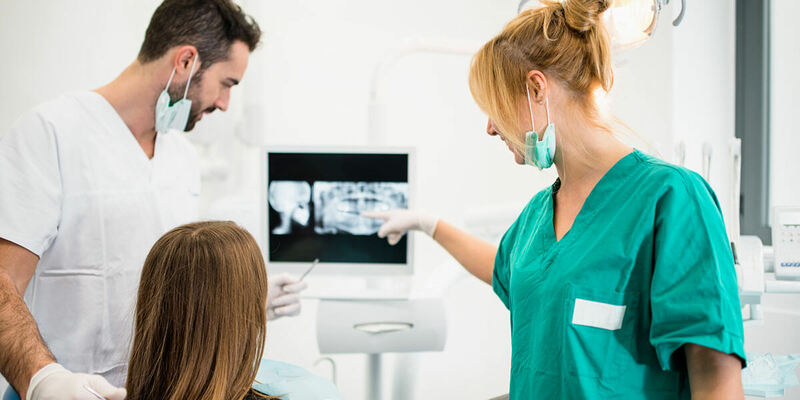 Digital x-rays reduce the amount of radiation needed as compared to film x-rays. The improved diagnostic capability of digital x-rays and the ability to view the x-rays on a computer screen allow the patient to better understand and follow treatment. Digital x-rays are instant, there is no longer a need to develop the film. Digital x-rays save time and increase patient care. It’s also a very green technology. By eliminating film, developer and chemical waste it is better for you and the environment! Using Electronic Medical Records our practice is able to quickly and accurately access patient information in order to provide the utmost in patient care. This helps to ensure patient confidentiality as well as reduce the need for paper. Using a digital format allows for quick access to your information when needed for insurance records yet provides a secure filing system. This new state of the art software helps explain procedures perfomed in our office and conditions that patients may present with. It assist in explaining the benefits of treatment, the consequences of non treatment and the procedures themselves. This case presentation tool represents the quality work our doctors perform. We strongly believe that educating our patients, helps our patients make informed decisions throughout the treatment process and ultimately contributes to better outcomes. Consult-Pro provides over 500 award-winning 3D video animations, 130 brochures and over 300 slide presentations including clinical pictures and case presentations; in fifteen languages. Following your visit, we will be glad to email or print a presentation or brochure for you for future reference.